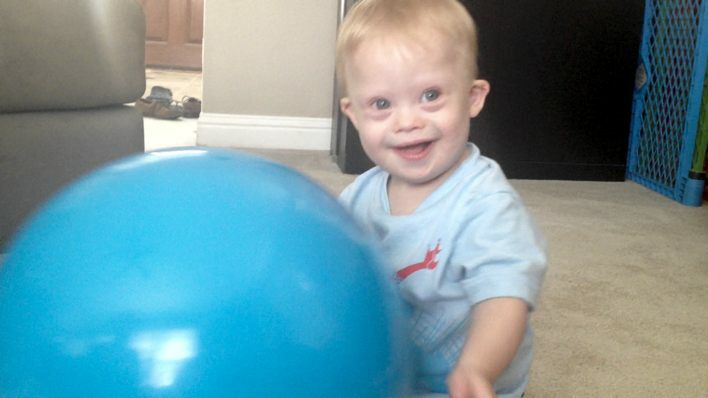 How Old Before A Child With Down Syndrome Rolls A Ball Back And Forth? You are here: Home / Parenting / Noah’s First Time To Roll A Ball Back And Forth On The Floor…And The Laugh I Love! This kid likes to have fun! Noah’s almost two years old in this video and it seems like he is in a stage right now where he is achieving new developmental milestones every day, and I love it! In today’s video you’ll actually see two of my favorite things Noah’s starting to do, laugh out loud and roll a ball back and forth on the floor! Learning how to roll a ball back and forth on the floor! Words can’t describe how proud I am of this little boy. His fine motor skills aren’t developed enough to control his “push back” of the ball (though they are quickly getting there) however as you can see in the video he is working hard to push the ball back towards me once it comes to him. Rolling the ball back and forth is really the first “game” we’ve gotten to play together, so it’s been fun as a dad to finally be able to interact with him like this. I could seriously play this game with him all day! If you close you’re eyes you’ll miss it! It’s so much fun playing with Noah and seeing how expressive he has become. His little face lights up my life! Parents, moments like these are priceless. Don’t forget to savor everyone of them because they come and go fast. 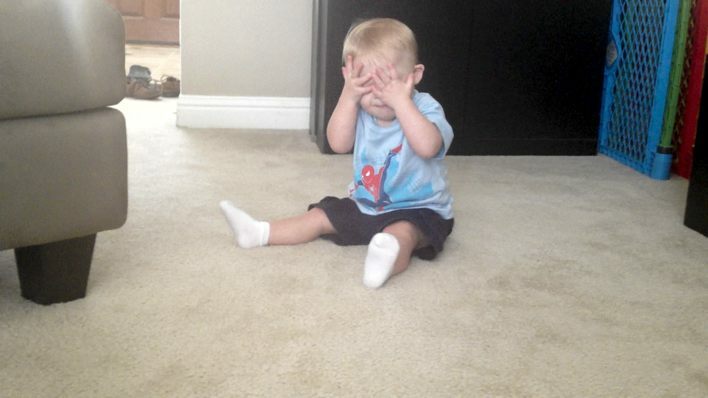 Kids don’t stay kids for long, and if you close your eyes you’ll miss them! 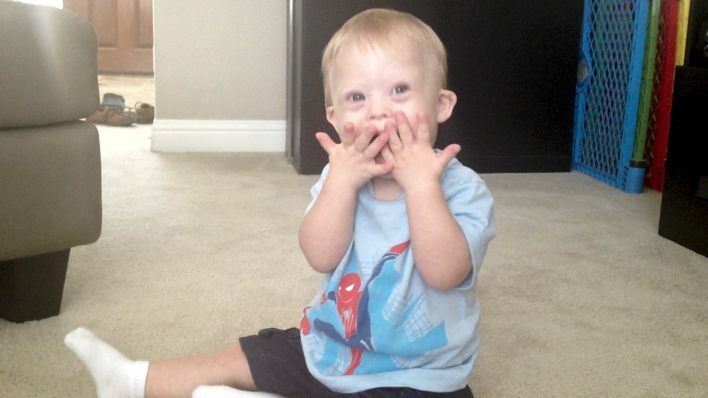 And if you’re a new parent of a child born with Down syndrome I hope videos like these give you hope and encouragement. You may be scared now, but you have a lot to look forward to…trust me! Has your child started rolling the ball back and forth yet? Also how old was your child when they started to laugh? Leave a comment and let us know. Not only do we enjoy reading your comments, but they are helpful to all of the other parents who read our blog as well. How cute is Noah’s laugh! Matthew will be 2 in a couple of weeks and he would have been about 14 months when he started rolling the ball back and forth. Playing with a ball has always been his favourite activity, I am sure he is going to be a footballer! He is starting to laugh out loud more and more now, especially when he is doing something he knows he shouldnt be like climbing on the furniture! Does your child have any brothers or sisters? That’s awesome! What sort of puppy are you getting? Noah has a Golden doodle and loves him! Adorable video!! He is just so cute!!!! 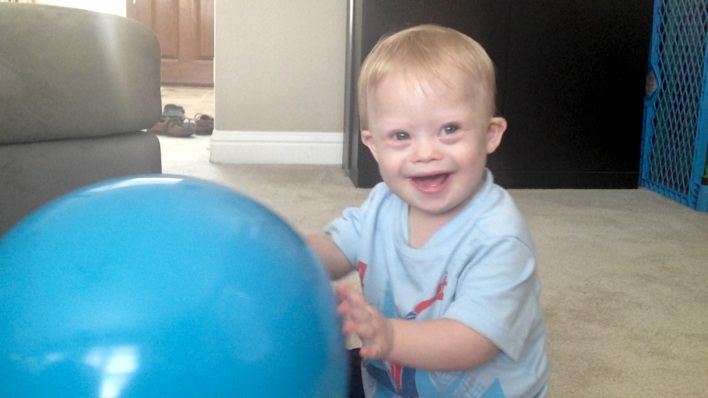 I just love Noah, he is such a happy kid with an infectious smile. Just seeing his face brightens my day. I just wanted to inform you that I have downloaded your child’s picture to be able to make a 1:12 scale miniature doll that looks alike once my clay skills get better. I just thought that cuteness was worth the effort. Also would love to be inclusive and raise awarness if or when I become a good miniature artist. If you’d rather me to delete it or have any concerns, please email me. P.S. : downloaded the one where he had a panda hat. I came across it through google pictures. Hi just came across your blog. Noah is a lovely baby and I hope he is doing fantastic after these few years. Although my child does not have Down syndrome,I will follow your blog since I love the way you chronicle your baby’s life. I pray to God that Noah has a happy and fulfilling life.